Tax Debt: Why Do I Owe the IRS? Tax Debt: One of the most confusing debts out there. Not many things instill fear into Americans than owing taxes to the Internal Revenue Service. Chills may go down your spine when you open a letter from the IRS with a bill. Your first question is: “Why do I owe taxes?” While income taxes are as certain as death to us, they can be even more troublesome when you get a surprise bill from the IRS that says you have tax debt to pay. Owing any amount to the IRS is not a pleasant experience but it is important to understand why you received that tax bill in order to fix the problem for future years. There are many reasons why you would receive a tax bill, some a lot more common than others. The first reason why you would owe taxes is that you are not withholding enough money from your regular paycheck from your job. Most jobs have a regular salary or hourly rate in which you are paid. When you are first starting with that job you are asked to fill out a W4 form for the IRS. This form lets your employer know how much federal income tax to withhold from your regular paycheck. Multiple factors go into the number of allowances you can claim on your W4. Typically, a single person can claim 1 or 2 on their W4 and have enough tax come out for the year. Additional allowances can be claimed depending on the number of dependents you have, as well as your age or if you have a disability. Where people get themselves in trouble is claiming a number way above the number of allowances they are entitled to or going complete exempt on their W4. While it is great to have that extra money in your paycheck, you are digging yourself a whole that may be too large to climb out of at the end of the year. Then, when you file your taxes, there is a large tax debt that is due to the IRS. Married couples with kids have another thing to keep in mind when filling out their W4 forms. If both spouses are working, they can only claim the total number of allowances they are allowed combined between the two spouses. For example: married couple with 3 children under the age of 16 has a total of 5 allowances to claim on their W4 forms. Husband claims 4 allowances on his W4 and the wife claims 4 on her W4 as well. Combined they are claiming 8 allowances, which is 3 too many. This will likely result in the couple not having enough taken out of their paychecks by the end of the year. To be proper, the person with more income should have fewer allowances claimed than the other spouse. So if the wife is making more money she should either claim 1 or 2 allowances and allow the husband to claim 3 or 4. More specific calculations can be made depending on the amount of total income to determine how to either give the family a large refund or closer to the exact amount of tax needed by the end of the year. One of the most common reasons individuals have tax debt is due to a new business or venture. People who are self-employed have a completely different situation when it comes to paying their federal taxes. They do not have the benefit of simply filling out a W4 form and have their employer paying the taxes to the IRS. Self-employed individuals are responsible for paying their own taxes. This is typically done on a quarterly bases with what are called estimated tax payments. Individuals have to calculate their tax based on their net business income. The typical self-employed individual is a truck driver or a construction/labor worker. These individuals can claim expenses incurred in the pursuit of earning income as business deductions and that reduces their amount of taxable income. In the past few years, the expansion of the “shared economy” has seen a rise in reported 1099 self-employed income. When most of these companies started they were not always on point with their 1099 filing for all their users. This allowed certain individuals to not report all their income. This has changed and almost all the companies like Paypal, Uber, Lyft, Etsy, and Airbnb will report any income you have earned through them to the IRS. So it may be nice to earn a couple thousand dollars over the course of the year driving for Uber, you have to remember that that income is still taxable and will have an effect on your tax returns. However, the problem lies with a lot of self-employed people is the fact they do not make their tax payments throughout the year and then do not have enough saved come filling season to pay their tax bill. This can cause a snowball affect where they can’t afford to pay both the back amounts owed and keeping current with the taxes that are owed on their current income. It’s important to consult with a tax professional before this cycle gets too large. They can help you get into a plan on the tax debt and help you with a game plan to stay current with your taxes moving forward. The next reason why people end up with tax debt is because they left a source of income off of their tax return. This can happen in many different circumstances, ranging from a missing W2 or 1099, or even all the way to not reporting a cancellation of debt (1099-C). If you worked as a subcontractor during any year and earned $600.00 or more, the person or the company is required to provide you with a 1099. Additionally, if a creditor has deemed a debt delinquent and believe it is uncollectable, then they report it to the IRS. Not including these situations in your taxes creates a situations called “under-reporting of income.” They are like mini-audits. The IRS has records of all the tax documents that are reported to your individual social security number. If those records do not match what is filed on your return, it can trigger this type of mini-audit. Typically, these can be handled pretty straightforward with documentation of why something was left off. However, it is also a possibility that you made a mistake and will have to accept the changes the IRS makes to your tax return, including additional penalties and interest. What causes taxpayers to owe in these situations is that they were originally issued a refund, but when the IRS adds additional income it causes the taxpayer to owe additional tax. At that point the IRS will want the additional tax as well as the refund they already paid you. It is important to make sure you are reporting all forms of income on your tax returns to avoid having this type of situation arise. The next situation that causes someone to owe taxes is the scariest to most taxpayers: The audit. The audit process can seem daunting for many reasons. The main reason is that people think the IRS is out to get them. This is not the case. Most cases the IRS initiates an audit because something on your tax return was flagged as being irregular. 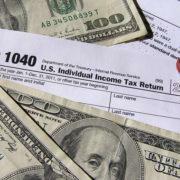 Your schedule A deductions or your schedule C business income are the two sections that are most likely to be audited. Typically, an audit is nothing to worry about if you have the documentation to back up what you are claiming on your tax returns. The problem comes into play when you either “guess” the numbers or have destroyed any documentation that was used to determine your numbers on your tax returns. The entire audit process can take 6 to 12 months and requires a lot of back and forth with the IRS over specific numbers. If you do not have a trained accountant who helped you with your tax returns and can help with the audit it is important to contact a tax professional to go over your options. These are just the broad strokes to why an individual may end up with a tax bill after they file their returns. It may come within a month or years later in the form of an audit. What is important to remember is that you have rights and options as a taxpayer. Contact your local tax professional to go over those rights and options. Ashley F. Morgan Law, PC can help you figure out your tax debt, help you address any taxes you owe, and also aid you getting everything in line going forward. Arthur Rosatti, Esq. is a Florida licensed attorney authorized to represent clients with the Internal Revenue Service and the U.S. Tax Court. He has experience negotiating with various taxing agencies on behalf of individuals and companies. His goal is to help his clients ensure their tax debt is accurate and get them into the best plan possible to manage the debt. https://www.afmorganlaw.com/wp-content/uploads/2018/01/8265014953_e1ae76baa3_z.jpg 427 640 Ashley Morgan https://www.afmorganlaw.com/wp-content/uploads/2018/01/logo.png Ashley Morgan2018-01-31 15:51:572018-02-11 18:35:30Tax Debt: Why Do I Owe the IRS?